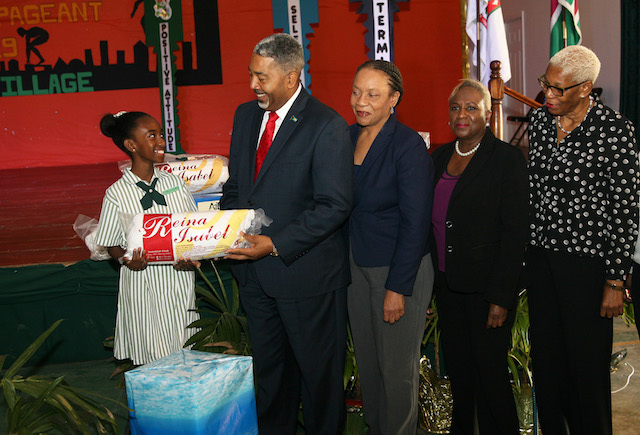 Students of Queen’s College’s Primary Years presented care packages in the form of toiletries and other items to Minister of Social Services and Urban Development, the Hon. Frankie A. Campbell in support of 'Student of the Year' Melania Nixon and her mission of assisting the elderly through Melania’s Operation Love and Gratitude non-profit organization. The care packages were presented to Minister Campbell during a Special Assembly hosted by Queen’s College Primary (Friday, January 18) to honour Melania as Student of the Year. Minister Campbell was accompanied by Mrs. Kim Sawyer, Deputy Director, Department of Social Services, and Ms. Laverne Stewart, Chief Welfare Officer, Senior Citizens Division, Department of Social Services. “Today we stand in support of our Student of the Year, Melania Nixon and her mantra and desire for the plight of the elderly in our society,” Mrs. Beneby said. “Melania’s passion and love for the Senior Citizens in our community comes from her personal story as she has been actively involved in assisting in the care of her grandmother – whose mobility is restricted. “Talking with, reading to, and playing violin [to her] were and are things she regularly does to make her grandmother happy. The smile on her grandmother’s face when she is interacting with her encouraged Melania to want to do more. Her love for her grandmother has influenced her to become an advocate and to make a significant difference in the life of older persons in a tangible way,” Mrs. Beneby added. He commended Administrators, Staff and parents at Queen’s College for their outstanding work in ensuring that students are not only committed to maintaining a strong academic foundation, but are also committed to participating in social outreach programmes. “I am not at all surprised at the academic prowess of a student from Queen’s College. I know that the school, the faculty, the parental involvement is such that (academic success) is the norm. That is not what moved me,” Minister Campbell said. “I am moved by the fact that at such a tender age, what started out as a personal concern for a family member grew sufficiently that an entire community of persons are now benefiting. I have been here many times for a number of Special Assemblies, but this is possibly one of the more special assemblies I have attended because it gives me the opportunity to say thank you to Melania, to say thank you to her mother Danella, to say thank you to Queen’s College and the Queen’s College Community for ensuring that education is not only about the ABCs and the 1,2,3s.